An ancient trading center on the Euphrates is being partially flooded by dam construction, spurring last-minute rescue efforts. In March, snakes and rats fled to higher ground on the banks of the Euphrates. Water rose in wells that had been dry for decades. The villagers of Belkis in southeastern Turkey abandoned their homes, removing the bones of their fathers and mothers from their graves before moving to neighboring towns. As water submerged them, thousands of pistachio trees turned green with river weeds. For a while, the dome of a mosque remained as an islet on the water's surface, but then it, too, disappeared. As the lake grew, the water began lapping at the ancient city of Zeugma, threatening Roman villas decorated with exquisite mosaics and frescoes. In 1986, the general directorate of the Turkish State Water Department decided to build a series of dams on the Euphrates and Tigris rivers to foster development of the impoverished southeastern region of Anatolia and to solve the country's energy crisis. Construction of one of these, a half mile from Zeugma, was put on the agenda, and four years later a feasibility study was submitted to the Turkish government and international construction companies. The lake to be created by the dam would inundate 21.6 square miles, including about eight percent of Zeugma. In 1988, the Turkish government authorized University of Chicago archaeologist Guillermo Algaze to survey the region to determine how the dams would affect historical and cultural heritage. Algaze established that some 245 areas of historical importance would be submerged. He presented his findings in international scholarly publications and submitted them to the Turkish government, but no institution or university heeded his urgent call for rescue excavations. 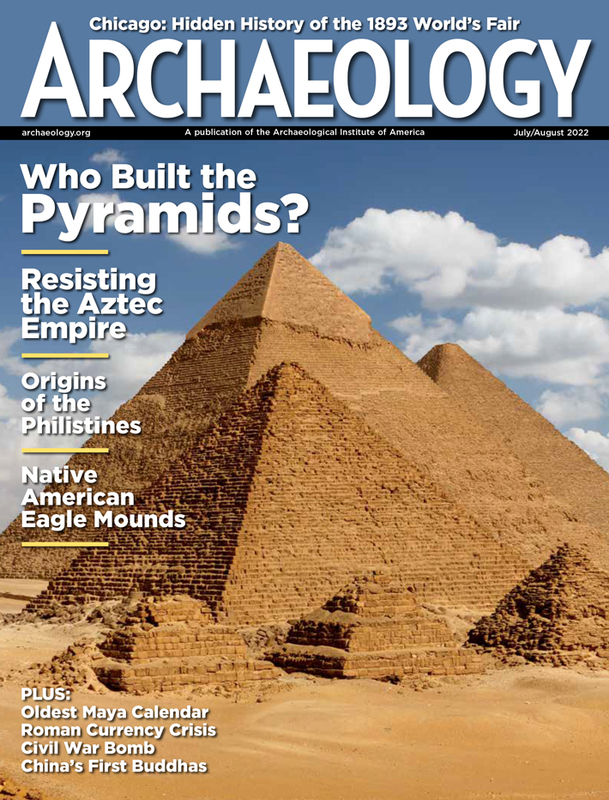 Working on their own, archaeologists from the museum in Gaziantep, the region's principal city, noted for its fine baklava, began excavations in 1992. Zeugma was founded in ca. 300 B.C. by Seleucus I Nicator, one of Alexander's generals, at a point where the Euphrates narrows. The city rises from the riverside on a steep slope, with most of the town on a hilltop overlooking the river. Zeugma means "bridge," "connection," or "crossroads" in ancient Greek. It could be rendered as "Bridgetown" or "Bridgeville." On the opposite bank, joined to Zeugma by a wooden bridge supported at first on boats and later on stone piers, was its sister city, Apamea. Trade between Mesopotamia and Anatolia, and for centuries later the Silk Road between China and the West, crossed the Euphrates at this point. Under Roman rule, Zeugma was home base for the Legion IV Scythica, a 5,000-man unit entrusted with deterring Parthian incursions and protecting the town and bridge. With trade flourishing overland and along the river, and with the soldiers contributing to the local economy, the city prospered, its population growing to some 70,000 people. As they grew wealthier, Zeugma's residents decorated the floors and walls of their villas along the riverbank with mosaics and frescoes. In the second century A.D., the appreciation of fine art brought by prosperity attracted artists from all corners of the Empire. The most recent excavations have uncovered splendid two-story villas with glass and iron bars in the windows and pipes for drinking and wastewater. Even everyday objects--ceramic and bronze oil-lamps, jars, vases, glass dishes, bronze and ivory statuettes of gods and goddesses--are the work of gifted craftsmen. With the Empire's recession in the mid-third century, Zeugma fell into decline. Parthian attacks intensified. The towns in the area, including Zeugma, were sacked by King Shapur I in A.D. 256, and four years later the emperor Valerian himself was captured and, presumably, put to death. Traces of the fire and destruction suffered by the city can still be seen, and this damage, coupled with subsequent earthquakes, completed the city's near total demise. Even though it was inhabited in later centuries by the Sassanians, Byzantines, Arabs, and Turks, the city never fully recovered, and there is no mention of it after 1048. The first sensational finds made at Zeugma were on a slope by the river, where Gaziantep Museum director Rifat Ergeç uncovered a villa beneath ten feet of soil in 1992. Pinkish stone columns surrounded the villa's atrium, which was decorated with a second-century A.D. mosaic depicting the wedding of Dionysos and Ariadne. Meanwhile, David Kennedy of the University of Western Australia, working with limited funds and the help of archaeologists from the University of Glasgow, was able to dig for one summer, in 1993, uncovering another villa damaged by the villagers' plowing. In his 1993-1994 excavations, Ergeç uncovered nine gravestones with figures and inscriptions on them, stone sculptures of a man and a woman, pieces of mosaic panel, and other artifacts. In 1994, he alerted the international archaeological community that work was going to start on the dam in 1996. The "save Zeugma" campaign--calling for Turkish and foreign solidarity and support for Zeugma in the form of funds and more archaeologists, conservators, and laborers--started that year. 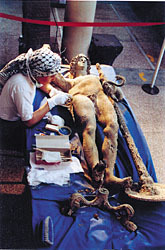 Ergeç himself, working with limited resources provided by the Ministry of Culture, continued sporadic rescue excavations. In 1995, the French foreign ministry provided funds for Catherine Abadie-Reynal of Nantes University to assist with the rescue efforts. She investigated the ancient city's layout, determining that the first settlement had started around the acropolis on a high hilltop. Inside the remains of the acropolis walls was a temple to Tyche, the goddess of destiny, the existence of which is known from Roman coins. Abadie-Reynal used geophysical prospecting to map the eastern bridgehead before it was flooded in 1999. Traces of mosaics were found in 1996 when bulldozers started work on the dam one-half mile from Zeugma. Mehmet Önal of the Gaziantep Museum investigated and uncovered two mosaics and the pool of a Roman bath. Construction was postponed for three months while Ergeç and Önal excavated the bath complex and various civic buildings surrounding it. Evidently, the Fourth Legion had moved here with the town's expansion in the second century A.D. Thirty-six pieces of mosaic and other artifacts, among them two legionnaire's swords, were recovered. Work then resumed on the dam, which rose over the baths and barracks of the Fourth Legion. When Ergeç and Önal started work on the riverside area destined to be submerged, they found two villas. Önal, who started excavating here in 1997, continued in the scorching heat of summer and through the winter's snow, laboring inside a tent. With two young Turkish archaeologists and ten laborers, he worked until the waters began flooding the area. Muammer Güler, the governor of Gaziantep, renewed the call to save Zeugma in 1998, channeling funds intended for the building of schools and hospitals to the rescue excavations. "We can build schools and hospitals next year," he explained, "but we can't save Zeugma." A Turkish company stepped up as a sponsor of the rescue efforts, providing funds for the museum in October 1999. Heavy earthmoving equipment and trucks given by the company speeded up the work. The sponsors also brought in a firm specializing in archaeological restoration work, which successfully removed all of the mosaics to the museum. The firm's Celal Küçük and Mine Ünsal worked overnight to salvage a Venus mosaic from a subterranean room in imminent danger of collapse. These conservators have now undertaken the work of restoring and preserving these mosaics. In the same villa as the Venus mosaic, Abadie-Reynal discovered one depicting the architect Daedalus and his son Icarus. In Greek mythology, father and son had the task of building a wooden cow for the Cretan Queen Pasiphae, who was in love with the bull kept by her husband, King Minos. 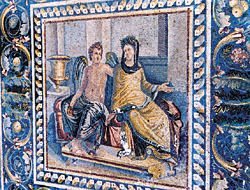 Another mosaic, showing the god Dionysos in a carriage drawn by leopards, covered the floor of the villa's dining room. Mosaics and frescoes decorated floors and walls throughout the villas. 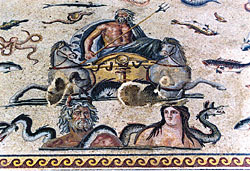 One mosaic depicts Poseidon along with Oceanos and his wife Thetis and sea creatures. On another, Achilles is shown departing for Troy. 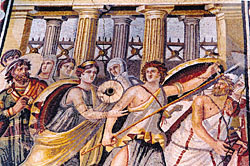 Other mosaics depict mythological subjects, including the birth of Venus in a seashell, Eros and Psyche, and Medusa. According to Önal, approximately 60 pieces of mosaic, amounting to 5,500 square feet, and some 50 frescoes, totaling 1,500 square feet, have been rescued from these villas. Floor and wall decorations weren't the only finds in the villas. Önal discovered a five-foot-tall bronze statue of Mars in one, along with 3,750 Greek and Roman silver and bronze coins. Abadie-Reynal rescued a hoard of 116 coins the day before the flooding began. In an exploratory trench dug into a monumental building, Ergeç found approximately 65,000 sealings, the most ever found at a single site. Carved in the stones of rings used to make the sealings were gods and goddesses, emperors and empresses, portraits of kings, scenes from mythology, and animal and plant motifs. On the front face of the sealings were the prints from the stones, while on the other side were traces of fabric, papyrus, and parchment. These sealings were attached to cargo and letters coming from all parts of the Roman world, and their analysis will shed light on trade and communication networks. While all this work was going on, the dam started filling up. One-fifth of the riverside area is now covered and the water level will continue rising until October 3. In June, with the world waking up to the drowning of Zeugma, the Packard Humanities Institute in California committed $5 million to saving Zeugma. 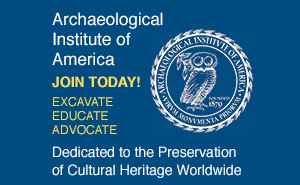 The funds provide for 50 additional foreign archaeologists and 200 workers. An Oxford Archaeological Unit team, under the direction of Rob Early, is already using ground-penetrating radar and machine- and hand-dug trenches to help survey a terrace above the river that will be submerged this October. Following this assessment, large-scale excavations will be undertaken there. The first indications suggest that the terrace is packed with villas and public buildings including the monumental structure in which the 65,000 sealings were found. Once rescue excavations are completed, conservation of the many mosaics and paintings will continue. An international team led by Roberto Nardi from the Centro di Conservazione Archeologica, based in Rome, will help with the work; a new mosaic museum is envisioned for Gaziantep. Consideration is being given to turning the unflooded portion of the site, more than 90 percent of it, into an archaeological park. A notable concern in planning this park is the risk of leaving the greater portion of the city at the mercy of looters (see "A Plundered Past"). Unfortunate as it is to lose part of Zeugma, the integrated, multidisciplinary rescue project may give rise to new initiatives that will help bridge the gap between Turkey's need for energy and the protection of its historic sites. Go to "A Plundered Past." Özgen Acar, with the Istanbul newspaper Cumhuriyet and a respected political commentator, follows archaeology and the illicit antiquities market in Turkey.